2015 Peugeot 208 facelift revealed | What Car? The Peugeot 208 supermini is the company's most popular model, and it has been given a 'substantial upgrade', with the new version going on sale in June. It has made its public debut at the 2015 Geneva motor show. The Peugeot 208 gets a selection of updates for 2015, including revised styling to the front and rear, as well as inside, along with updated technology, tweaked engines and increased options and colours. The 208 also now comes with a new trim level - GT Line - which brings many of the styling attributes of the 208 GTi. Visually, the 2015 Peugeot 208 gets a new front bumper with sharper lines, a wider grille and more chrome on the front end. There are new headlights from Active trim level upwards, which come with an LED signature. There are also new LED lights at the rear. Inside, the 208 gets a leather-trimmed steering wheel from Active spec upwards, while the dashboard features a new finish on the higher-specification versions. The 7.0in touchscreen, which is also available as standard from Active onwards, has been upgraded to get the latest software. This includes a new Mirror Screen function, which allows the screen of a compatible smart phone to be displayed. What engines does it get? The 208 gets a revised set of engines. There are three 1.6-litre diesels, all of which emit less than 95g/km of CO2. They come in 74bhp, 99bhp and 118bhp power outputs; both the 74bhp and the 99bhp version are paired with a five-speed gearbox and emit just 79g/km and have an official fuel economy of 94.1mpg. The 118bhp version comes with a six-speed manual 'box and emits 94g/km. The two most powerful of these come with stop-start engine technology, whereas the 1.6 BlueHDi 75 doesn't. There is also a new, more powerful, petrol engine. The 108bhp turbocharged 1.2 PureTech petrol is the same engine that features in the Peugeot 308, and comes with stop-start engine technology, a five-speed gearbox and CO2 emissions of 103g/km. The other two petrol engines - a 67bhp 1.0-litre and an 81bhp 1.2-litre - are both unchanged. The facelift brings a new orange paint job, and a new trim level, GT Line, which is based on Allure trim and comes with visual upgrades such as an 'Equalizer' grille, gloss black surrounds to the grille and foglights, 17in alloy wheels, chrome window surrounds and exhaust finisher, GT Line badges on the grille, wings and bootlid and red Peugeot letting front and rear. Inside, it gets sports seats with red stitching, gloss black door handles, leather sports steering wheel aluminium door sill strips and aluminium pedals. 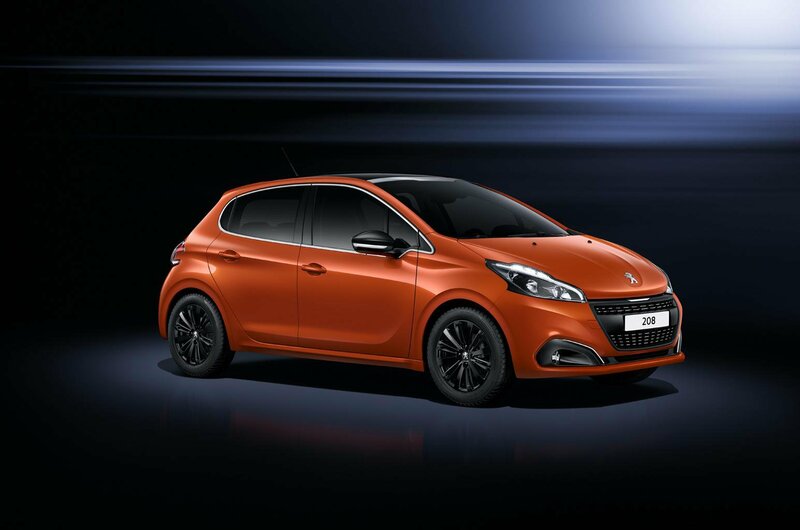 The 208 comes with a new Menthol Pack, which brings a restyled grille with a gloss black grille finisher, gloss black surrounds to the front fog lights, black door mirrors and coloured side repeaters. There is also the choice of two new alloy wheels: 16in and 17in. There is also an automatic gearbox, a six-speed unit, available on the 1.2-litre 110 petrol. Final prices for the 208 facelift have not yet been revealed, but are not expected to increase drastically over the current car's on a like-for-like basis. The new models will represent the biggest change to the price list, with the 1.2-litre 110 petrol set to sit above the 1.2-litre 82 in the range and the GT Line expected to command a premium over the Allure trim. Prices currently start at £10,195 and rise to £19,100 for the GTi model. There are decent Target Price savings on the current 208 model, which vary throughout the range, from around £600 on the entry-level car up to around £1800 on the GTi. Similar savings are likely to be offered on the 2015 version. What are its rivals like? The biggest rival to the 208 is the best new car on sale today - the 2015 Skoda Fabia was named the 2015 What Car? Car of the Year, so the bar in this class has been set very high. The Fabia puts sensible practicality over excitement, but is a great all-round car. The Ford Fiesta is the most popular in this class in terms of sales, and with good reason. It is a great car to drive with a wide range of engines on offer - the ST performance model is the one that the Peugeot 208 GTi has to tempt buyers away from.